Details: Bouqet of 11 medium stem red roses . Available in yellow, red, pink, white and peach. See the list of available destinations. We can guarantee delivery on the required date if the order has been placed at least 1 business day beforehand. We can provide same day or next day delivery to many cities. In order to be sure, please send an inquiry to our administrators about an urgent delivery by e-mail. We guarantee Free English / Russian or/and Belarusian translation of your gift card message with your order. Please read Terms and Conditions prior to ordering. Make on-line payment thru the Internet using the system of payments "2checkout.com Inc". The most credit cards are accepted. 2Checkout.com, Inc.. is an authorized retailer of goods and services provided by Solard. make payment thru Bank Wire Transfer. Please, contact our administrator via e-mail with request to provide payment details for payment processing via Webmoney, Rupay, Western Union, Money Gram or Bank Wire Transfer. 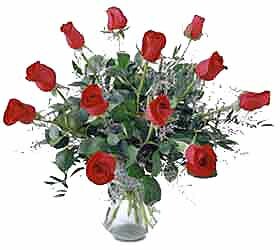 We guarantee flowers, presents delivery in time!